So... I'm not sure that I'm turning into Forrest Gump anytime soon, but I went for my first run today. Mostly because I live in the Pacific Northwest and the weather here is so damn unpredictable. It started out windy, and rainy, but by about halfway through It was POURING. I came home drenched, my legs hurt, my knee hurts but damn it I did it! Day 1 of (many) 24! 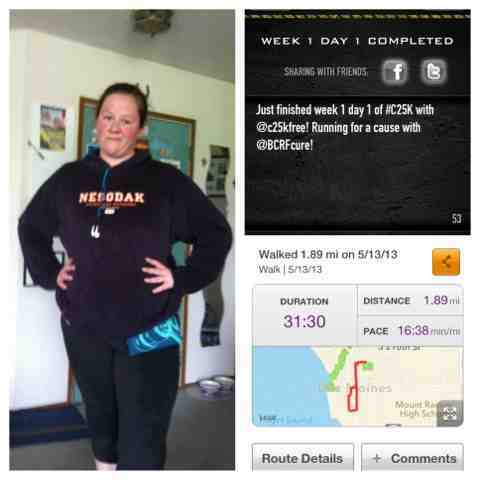 I downloaded an app on my cell phone called C25K it helps you train to run 5 K in 8 weeks. The plan is to run 3 times a week until you're running 3 miles in one day. I look optimistic about it... don't I? I'll check in once a week, and let you know how it's going, but I have to say I ran / walked nearly 2 miles today after zero exercise, and I am feeling it, but I am not dying (yet). An even bigger milestone is that this is the first "Real" hard (i.e. impact) exercise I have had on my knee since I blew it out skating. Ice is wonderful, and I'm headed for an Epsom salt bath shortly.